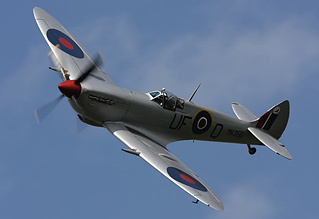 This year sees the commemoration of the 70th Anniversary of the Battle of Britain, and aircraft based at RAF Duxford played a key part in the victory over the Luftwaffe. 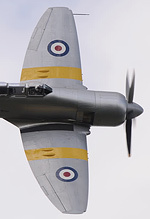 Held on 16 May, Duxford's season opening Spring Air Show was planned to feature aircraft from the birth of the RAF right up to the modern day Eurofighter Typhoon, in what promises to be a busy summer at the historic Cambridgeshire airfield. Stuart Norris was at the Imperial War Museum's season opener. Additional photos from Ian Matthews, Steve Buckby and Phil Whalley. The show didn't get off to the best of starts when it was announced that the bothersome volcanic ash cloud would mean the Typhoon, Lancaster, Hawk and Tucano were grounded and unable to take part in the show. However as the day unfolded, it was deemed that the ash was no longer a threat to the local area, allowing the Hawk and Tucano, both already on the ground at Duxford, to take their slots. Despite the Typhoon not being able fly, the modern day RAF was still well represented, with the Tutor and Sea King HAR3A joining the aforementioned trainers. The Sea King, provided by 'B' flight of 22 Squadron based at Wattisham in Suffolk, was making a welcome appearance back on the 'circuit'. The final modern military aviation act came in the form of the 'Black Cats' from 702 Naval Air Squadron. The Battle of Britain Memorial Flight (BBMF) provided their Mark II and Mark IX Spitfires alongside their pair of Hurricanes and the Dakota, all of which took part in the flying display. The Spitfire IX was due to have flown in formation with the Typhoon, but with the 29(R) Squadron jet grounded, MK356 was put through her paces in a fine solo display before heading home to RAF Coningsby. The SE5a and Bristol F2B Fighter from the Shuttleworth Collection embodied the early days of the RAF. Other propeller types on show included Historic Aircraft Collection's (HAC) Hawker Nimrod II, Andrew and Geraldine Dixon's Percival Pembroke, Mark and David Miller's de Havilland Rapide, which flew with a pair of Chipmunks and The Fighter Collection's (TFC) Harvard and Sea Fury T20. The Nimrod and Harvard, in particular, were most welcome sights, as the Nimrod suffered major engine problems last summer and this was her first appearance since, and the Harvard is the first of TFC's UK registered aircraft to appear at an air show for over a year. Duxford's resident B-17G 'Sally B' and The Fighter Collection's TF-51D 'Miss Velma' also flew, and served to illustrate to the crowd that the Flying Fortress and Mustang were both operated by the RAF during the Second World War. Peter Vacher's Hurricane Mk I, a Battle of Britain Veteran, was a key element of the 70th Anniversary, and to that end was involved in two formations marking the the occasion, the first of which saw RA118 joined by the BBMF's own veteran of that Battle, Spitfire II P7350, to open the flying. That honour was originally intended to fall to the Typhoon, but it seemed fitting that these two aircraft got the proceedings underway, particularly at this venue; Spitfires of 19 Squadron, and Hurricanes of 242 and 310 Squadrons were based at Duxford during the height of the Battle of Britain and these three Squadrons went on to be part of Douglas Bader's famous 'Big Wing'. Later in the day, the Vacher Hurricane was in action again, joined by Historic Aircraft Collection's Hurricane XIIa, which, in addition to the BBMFs pair of IIc's, meant that there was a very rare sight of four "Hurris" at the show. The planned flypast of all four Hurricanes was reduced to three though, after PZ865 failed to start. Nevertheless the sight of three Hurricanes in the skies together is still a scarce gathering in itself, and their salute was greatly appreciated by the crowd. The final propeller aircraft in the show was the Percival Provost, which flew with its younger, Jet powered, relative. The most unusual performance of the day was that of the Cambridge Aero Club, who turned up with an Extra 200 and formated a trio of Cessna 172s! The Cessnas remained in a well flown formation for a series of flypasts, while the Extra showed off its aerobatic capabilities. 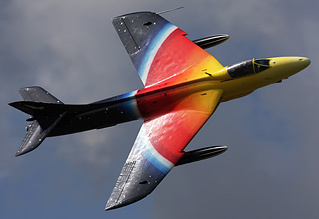 Jonathan 'Flapjack' Whaley, in his strikingly painted Hunter F58 'Miss Demeanour' and Mark Linney in Golden Apple Trust's F-86A Sabre represented the early jet days of the RAF. Like the B-17 and Mustang flown earlier in the day, the Sabre is not normally associated with the RAF, but Canadair built models were in service for several years during 1950s. Both of these classic jets provided solo displays, but the former was the star of the show for many people. 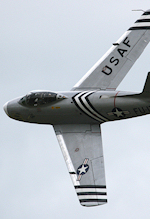 With Jonathan heading for home at the same time as the Sabre, the pair flew three passes together before Mark Linney closed the show with one of his best displays in the F-86A. The organisers deserve a special mention for managing to rearrange the flying display around the ash cloud at such short notice. The flying got underway on time as advertised and there were no noticeable gaps in the programme. We look forward to Duxford's other events during the summer.